This is the second of my two-part interview with Marjorie Adams. Marjorie’s great-grandfather, Daniel Lucius “Doc” Adams, is a candidate for induction into the Baseball of Fame this year as part of the Pre-Integration ballot. You can read Part I here. “Doc” Adams supported a nine-player starting line-up, is that correct? What were some of “Doc” Adams’ other contributions to early baseball? I understand that he worked on producing early baseball equipment. Doc supervised the manufacture of the bats for the Knickerbockers. He would go all over New York City to furniture makers and select the wood himself. He supervised the turners so that the bats would have the desired taper, length and diameter. He’d charge opposing teams $5 to make four balls. I doubt he made a profit. The money probably just reimbursed him for the leather and yarn. He’d get the rubber from his friends’ old worn-out rubber galoshes, which he would cut into strips. Alexander Cartwright gets much of the credit for developing the game of baseball. How would you compare and contrast Cartwright and “Doc” Adams? Alexander Cartwright, as I understand it, proposed the formal organizing of what became the Knickerbocker Base Ball Club and was present at its founding on Sept. 23, 1845 (Doc joined the team about a month later.) Also, I believe Cartwright was involved with the first codifying of the rules in 1845. The following year, Doc was elected Vice President of the Club, and Cartwright was elected secretary. Doc Adams played in the Knickerbocker’s first intramural game on June 19, 1849. Cartwright’s last game with the club was in late 1848. Early in 1849, Cartwright left New York City to join the California Gold Rush and eventually settled in Hawaii. From all I have read, Cartwright was a very good pitcher. (That was the only position Doc never played.) Considering that Doc played with the Knickerbockers for 17 years and Cartwright for three years, I’m not sure it is fair to either gentleman to try to compare them since so little concrete evidence exists as to their skills as players. Why do you think your great-grandfather has slipped through the cracks and not already been elected to the Hall of Fame? In fact, that accounts for why we don’t know more about him than we do. He never really talked about the game except for The Sporting News interview in 1896. How would you sum up your case for “Doc” Adams being elected to the Hall of Fame? Most baseball fans really love the stats. They love ERA, RBI, batting average, etc., and I absolutely understand that. Those stats are the yardstick by which all players are judged. Stats, though, did not really exist for mid-19th century players. But Doc Adams was far more than a ball player. He invented a key position in the game in shortstop and made the decision to put bases 90 feet apart, changes to the game that are still with us more than 150 years later. He was Vice President, President and Director of the Knickerbockers, and he headed-up the three rules committees of the New York-area baseball clubs from 1853 to 1858. He also made the equipment for the team. Most historians credit Doc for keeping the game going during its dark, early days and thereby possibly saving the game as we know it today from oblivion. Still, in modern terms, it is not easy to judge his on-field abilities, but his contributions to the most formative years of the game are very clear. I believe that in this, the 170th year of his joining the Knickerbockers, it is the year he should be acknowledged by the National Baseball Hall of Fame. However, if it does not happen this year, I will not let this rest. I will continue to work toward what I want to see: Doc’s plaque at the Hall. This quest is as much for my father and grandfather as it is for Doc, and none of those gentlemen would approve if I gave up. Imagine how baseball might be now if Doc had given up in the early years of the Knickerbockers. When did momentum build to get “Doc” Adams’ name on the Hall of Fame ballot? It really started last year when Doc was awarded the 2014 Overlooked 19th Century Baseball Legend by the 19th Century Committee membership of SABR (the Society of American Baseball Research). Back in 1980, The New York Times announced that Nelson Doubleday Jr. had bought the New York Mets, and the Doubleday/baseball myth resurfaced. My nephew, Nathan Adams Downey (then age 12), wrote the Times in response to the article. He based it on the 1939 essay my grandfather wrote, and the entire letter was published above the fold. That might have been the first real mention until the 1990’s when the Internet made baseball research easier. I started this quest in 2011. I had met Gary O’Maxfield of the Friends of Vintage Base Ball in Hartford, Ct. He knew ALL about Doc (which astonished me) and one day in 2011, with all the innocence of a small child, I asked him “Should Doc Adams be in the Hall of Fame?” He said, “Of course!”, or something to that effect. It never occurred to me. To me, the Hall was Babe Ruth, Mickey Mantle, Jackie Robinson, etc., the really big, important players. So, here I am four years later. And if Doc does not get into the Hall on the Pre-Integration Era Ballot this year, I’ll be back. To what extent is the effort to get “Doc” Adams into the Hall of Fame an Adams family affair? Well, I mentioned my nephew, but I also must give huge thanks to my sister, Nancy Adams Downey. She has been my rock and shoulder to cry on and whine on! Since 2011, though, I have been the “front man” (as it were) on this. My other nieces, nephews and cousins have all been supportive and enthusiastic. I have assembled a team (my “Doc Team”) of just the greatest fans of the game and its history, and I could not have gotten to this point without any of them. The best part of the last four years has been all the great people I have met. I am truly blessed to have made so many new friends. MLB historian John Thorn supports the induction of “Doc” Adams into the Hall of Fame. How important is that? How tightly are your fingers crossed? Do you think this will finally be the year? Marjorie Adams is the great-granddaughter of baseball pioneer Daniel Lucius “Doc” Adams. Doc is a candidate for induction into the Baseball of Fame this year as part of the Pre-Integration ballot. Baseball experts credit Doc Adams for creating the shortstop position, serving as an early leader of the Knickerbocker Baseball Club and leading several early rules committees. He manufactured bats, balls and other equipment, and much more. Doc also ruled that bases should be placed 90 feet apart from one another. Not surprisingly, Marjorie Adams is one of Doc’s biggest supporters. Born and raised in New York City, Marjorie now lives in Connecticut. She has a bachelor’s degree from Stephen’s College in Columbia, Mo., and is retired from working in the furniture business. She likes American history, Broadway musicals and Shakespeare. She also enjoys educating people about Doc Adams and is a big fan of both the New York Yankees and New York Mets. This is the first of my two-part interview with Marjorie. Marjorie, could you provide a brief biography of your great-grandfather? In 1866, Doc retired from medicine and moved to Ridgefield, Ct. Doc served one term in the state legislature (1870) and about 15 years as first president of the Ridgefield Savings Bank. In about 1888, he moved the family to New Haven. He died there on Jan. 3, 1899. While growing up, how much did you know about your great-grandfather’s contributions to early baseball? In 1939, my grandfather, Roger Cook Adams (1874-1962), wrote an extensive essay on Doc, not for publication, just for his family and descendants. Because of that, we knew quite a bit. I’ve learned so much more about him, though, in the last few years. I’ve read about 150 letters written to Doc by his father. They cover the years 1827-1864. They’re enormously revealing as much for what they don’t say as for what they do say. Not one letter to Doc mentions baseball at all. I do have a letter from 1832, written by Nancy, Doc’s younger sister, in which she writes to her big brother: “I have not played with your bat and ball as you bid me. I forget it every morning and indeed I have not seen it since you went away.” She was 11, and Doc was 17. Why do you think the letters fail to mention anything about baseball? I suspect his father would not have approved of such a pursuit. He was a strict Congregationalist, and he would not have considered it worthy of a great deal of time and effort except maybe for a little exercise. To his father, education and making your way in the world with high morals and an active religious life was everything a man should aspire to accomplish. How did “Doc” Adams’ baseball career begin? According to Doc in a Sporting News interview in 1896, “I was always interested in athletics while in college and afterward, and soon after coming to New York  I began to play base ball just for exercise, with a number of other young medical men.” (Baseball was spelled “base ball” in the early days.) I think he thought of the game as a hobby. What do we know about “Doc” Adams’ ability as a player? “Doc” Adams stands in the middle of this group of New York Knickerbockers in 1859. Not a great deal, but he was terribly enthusiastic about the game and would do most anything to promote it among the members of the Knickerbocker Base Ball Club. I do have a quote from a New York City newspaper, Spirit of TheTimes, Dec. 6, 1856: “Adams, as short field has for many years, (sic) been deservedly distinguished. Excellent as a catcher and probably the most accurate thrower in any club. A ball sent to him to first base rarely fails in proving fatal to the runner. He strikes with great force, but by raising the ball he gives many chances to the long field.” Doc played, at one time or other, all positions except pitcher. He was even an umpire, and on Sept. 10, 1858 at the third match of the Fashion Race Course Games on Long Island (an early All-Star game), was the first umpire to apply the new rule of calling men out on non-swinging strikes. Doc had presided over the committee that had passed that rule earlier in the year. Doc also presided over the convention that founded the National Association of Base Ball Players (the first professional baseball league). Is it true that “Doc” Adams helped form the famous Knickerbocker Base Ball Club? No, Doc was not there when the Knickerbockers were formalized as a club on Sept. 23, 1845 (170 years ago). Again, according to Doc’s 1896 interview with The Sporting News, he “joined about a month later” He did play in two intramural games in November of that year. Among other things, what Doc can be credited with (and this comes from a number of respected historians and my grandfather’s 1939 essay) is holding the team together in the earliest years of the club. After the June 1846 game against the New York Base Ball Club (which faded away after that), there were no other teams in New York until about 1850 for the Knickerbockers to play against, and enthusiasm ran low. Doc was VP of the club in 1846 and President from ’47-’49 (and ’56, ’57 and ’61). He gave the Knickerbocker members lectures at team meetings and dinners to encourage them to show up for practice days and intramural games. There is much more on this in The Sporting News interview, which is on our Doc Adams web site. It was Doc’s “love of the game” (his own words) that got members onto the field in the discouraging early days. How did your great-grandfather go about creating the shortstop position? Doc was responsible for making the balls for his club. Later, he made balls for other New York-area teams. These balls were very light and while they could be batted a long distance, they couldn’t be thrown very far. Getting a ball from the outfield back to the bases was not easy, so Doc created an intermediary player/position to catch the balls from the outfield and throw them back into the infield. As the balls improved and got heavier, Doc moved himself into the placement of the shortstop position that it is today. The first year that he occupied that shortstop position was in 1849/50. And according to my grandfather, it was his favorite. The late sportswriter Red Smith once wrote that 90 feet between bases is the closest that man has ever come to perfection. Your grandfather gets credit for establishing that length. He also rejected the idea of a “bound rule.” Could you talk about these subjects? Oh, thank you for the Red Smith quote. Yes, Doc did do that calculation of 90 feet between bases, as he said in the 1896 interview, “after careful study”. He also set the distance from the pitcher’s mound to home plate at 45 feet (That measurement varied through the years. In 1893, baseball ruled that the distance should be 60 feet, six inches, the current measure.) It’s important to keep in mind that Doc’s father was a mathematician. Doc was, too. He helped his father revise one of the editions of his math and accounting textbooks in the early 1860’s. Actually, I think he preferred math to his medical practice. As for the “bound rule” (A fielder could catch a batted ball on one bounce and it would still be recorded as an out. ), Doc worked very hard to eliminate that from play. He frequently and vocally spoke in favor of the “fly game” (A player needed to catch the ball before it dropped for an out to be recorded.) because he thought it made the game manlier. Unfortunately for Doc, he would be disappointed as the rule did not change until after he retired. But in his last speech before the rules committee and his club, he predicted that someday the fly game would be the standard, and the bound rule eliminated. The man who developed the shortstop position, the pitcher who won an MVP award in 1935, and eight other early baseball executives and players may be enshrined this summer in the Baseball Hall of Fame. They comprise the Pre-Integration Committee candidates. A candidate needs 75 percent of the vote for induction. The Pre-Integration Committee is made up of 16 Hall of Fame members, plus an assortment of executives, media members and historians. The Hall of Famers include Bert Blyleven, Bobby Cox, Pat Gillick and Phil Niekro. Results of the Dec. 7 vote will be made public on Jan. 6, 2016. Enshrinement will be July 24 in Cooperstown, N.Y. The Pre-Integration candidates were selected from a group of managers, umpires, executives and players who made an impact on the game from its origins through 1946. The Pre-Integration Era ballot by the Historical Overview Committee, comprised of 11 veteran historians: Dave Van Dyck (Chicago Tribune); Bob Elliott (Toronto Sun); Jim Henneman (formerly Baltimore Sun); Rick Hummel (St. Louis Post-Dispatch); Steve Hirdt (Elias Sports Bureau); Bill Madden (formerly New York Daily News); Jack O’Connell (BBWAA secretary/treasurer); Jim Reeves (formerly Fort Worth Star-Telegram); Tracy Ringolsby (MLB.com); Glenn Schwarz (formerly San Francisco Chronicle); and Mark Whicker (Los Angeles News Group). Sam Breadon (1876-1949) – Breadon served as president and majority owner of the St. Louis Cardinals from 1920 through 1947. Under his tenure, the Redbirds were transformed from a perennial also-ran into a National League powerhouse. St. Louis won nine pennants and six World Series with Breadon as owner. Players such as Rogers Hornsby, Frankie Frisch, Dizzy Dean, Pepper Martin, Johnny Mize, Enos Slaughter, Red Schoendienst and Stan Musial prospered in the Breadon era. 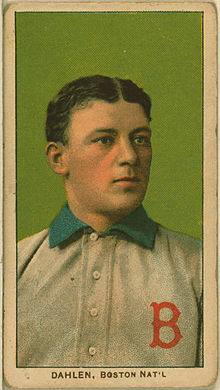 Bill Dahlen (1870-1950) – Dahlen played 21 seasons (1891-1911) in the majors. The shortstop batted .272 lifetime with 84 home runs. He also stole 548 bases. Following his retirement, Dahlen stood first on the all-time list in games played (2,443) and in the top 10 in RBI (1,234), walks (1,064), doubles (414), runs (1,589) and extra-base hits (661) and several other categories. He played for the Chicago Orphans, Brooklyn Superbas, New York Giants and Boston Doves. Wes Ferrell (1908-76) – The right-hander pitched 15 seasons and for six teams (most notably, the Cleveland Indians and Boston Red Sox). He compiled a 193-128 lifetime won-loss record with a 4.04 ERA. A six-time 20-game winner, Ferrell led the American League in complete games four times. Ferrell threw a no-hitter in 1931 and was runner-up in the MVP race in 1935. August “Garry” Herrmann (1859-31) – The president of the Cincinnati Reds from 1902-27, Hermann also led the game’s National Commission from 1903-20, in effect making him the game’s commissioner. He also led efforts to start the modern World Series between the National and American leagues. Marty Marion (1916-1911) — A tall (6-foot-2), lanky shortstop, Marion played for the St. Louis Cardinals from 1940-50 and the Browns from 1952-53. An eight-time All-Star and three-time World Series champion, Marion batted .263 lifetime and won the 1944 N.L. MVP. Marion also managed the Cardinals in 1951, the Browns in 1952-53 and the Chicago White Sox from 1954-56. Frank McCormick (1911-82) — McCormick won the 1940 N.L. MVP for the Cincinnati Reds. The first baseman made nine All-Star teams and led the league in RBI in 1939. McCormick batted .299 over his 15-year career and topped the N.L. in hits from 1938-40. Harry Stovey (1856-1937) – Stovey played 14 seasons as an outfielder in the National League and American Association. One of the game’s early power hitters, he led his league in homers five times. He belted 174 home runs and swiped 549 bases. Stovey broke in with the Worcester, Mass., Ruby Legs and saw action with five other teams. Bucky Walters (1909-1991) – The right-hander’s 198-160 lifetime won-loss record belies his many accomplishments. Walters went 27-9 for the 1939 Cincinnati Reds and won the N.L. MVP. He was a six-time All-Star, who led the league in wins three times, ERA twice and strikeouts once. Walters had a 3.30 career ERA.